The Blanchard Valley Port Authority met Thursday morning, April 11th to discuss possible plans for a $30 million investment on South Main Street. Retail, parking, and residential space would occupy the site. 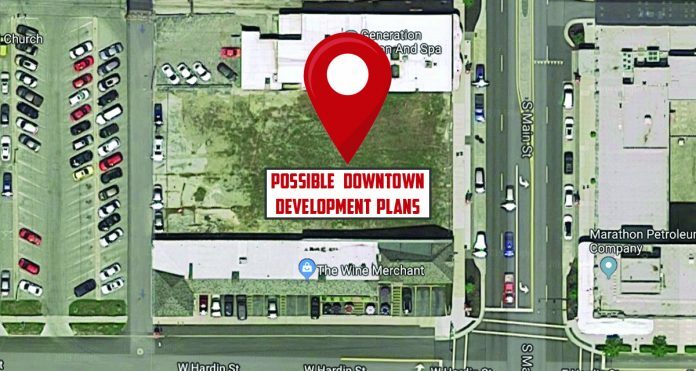 The project would involve redevelopment of a large portion of the west side of the 500 block of South Main. This includes the site of the former Argyle building, which burned in 2012. Part of the city-owned parking lot behind the lots would also be utilized. Discussion of the possible sale of the city-owned parking lot will take place at an upcoming Findlay City Council meeting. The front of the ground floor would house retail. The back half and entire 2nd floor of the structure will be reserved for parking. Several floors of housing would then occupy the 3rd floors and above. Public speculation over the last few months is that the plans could possibly involve the demolition of the 1920s-era former Cooper service station on the corner of Main and Hardin, south of the site, and the Rieck Buildling to the north. We will share additional details as they are made available.